US Secretary of State Condoleezza Rice has said she has no problem with people protesting during her two-day visit to the north-west of England. In Liverpool on Friday evening she was greeted by dozens of anti-war protesters. One was later arrested for breach of the peace in the city centre. Earlier she saw protesters at a school in Jack Straw's Blackburn constituency. She then went to Sir Paul McCartney's Liverpool Institute for Performing Arts (LIPA) for a concert in her honour. In Liverpool city centre on Friday night one anti-war protester was arrested and he is being questioned by police. Earlier one student outside LIPA said it was a "disgrace" that Ms Rice had been invited to the academy when the former Beatle was an anti-war campaigner. "We wish she hadn't been invited here. Why should we be seen to condone the actions of this woman?" he said. More than 1,000 campaigners gathered outside Liverpool Catholic Cathedral for a rally at about 1800 BST and sang John Lennon's anti-war anthem Give Peace A Chance. Ms Rice's visit started on Friday as a guest of the foreign secretary. She said she was not surprised by the protests accompanying her visit. Speaking at the BAE Systems complex in Samlesbury, Lancashire, Ms Rice said: "People have the right to protest - that's what democracy is all about. "I have no problem with people exercising their democratic rights. "I am equally - if not more - impressed with the warm welcome. "I am enjoying the visit and I look forward to continuing it. "If it is not possible for me to go somewhere and to be willing to encounter people with different views then I'm really not doing my job." Ms Rice moved on to the 1,200-pupil Pleckgate High School in Blackburn where about 150 protesters gathered. 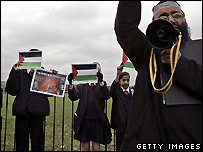 Outside the school, mother of five Rabiya Adam, 33, said the US secretary of state was not welcome in her home town. "When I found out she was coming here to speak to our children, I didn't want her to preach what she did in Iraq." Ms Rice and Mr Straw then moved onto Ewood Park, the home of Blackburn Rovers, where she delivered a lecture on liberal democracy organised by BBC Radio 4's Today programme and Chatham House. She said no-one should doubt America's commitment to justice and the rule of law. She also admitted mistakes had been made in Iraq. 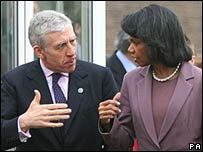 The two-day visit is designed to repay a visit Mr Straw made to Ms Rice's hometown of Birmingham, Alabama, last year. Earlier, mosque leaders in Blackburn decided to withdraw their invitation for Ms Rice to visit them on Saturday, amid warnings of protests from a group of Muslims which included members of the Stop the War Coalition. On Saturday Ms Rice is expected to meet Muslim leaders in Blackburn and visit the Merseyside Maritime Museum on Liverpool's Albert Dock.